PITTSBURGH —A man with whom the prosecution says Dr. Robert Ferrante suspected his wife was cheating on him was called as a witness Friday in the seventh day of Ferrante’s homicide trial. Also on Friday, an email was read in court about a trip that Ferrante’s wife, Dr. Autumn Klein, was scheduled to take. Prosecutors pointed out that “Boston” referred to a trip Klein was scheduled to make in May to visit her colleague, Dr. Thomas McElrath, who took the witness stand Friday morning. Prosecutors say Ferrante was jealous of McElrath and did Internet searches on him. McElrath told the jurors he and Klein attended a conference together a few months before she died, and that they had been colleagues who worked together for about eight years. He told the jury he invited Klein and her husband to stay with him at his home, then told defense attorneys that he had never met Ferrante. Prosecutors then called Jennifer Janssen, assistant chief toxicologist with the Allegheny County Medical Examiner’s Office, who discussed the blood samples that were taken after Klein was admitted to a hospital. Janssen testified that Klein’s blood tested positive for cyanide and that the ME’s office was not aware of the problems NMS Labs had until days later. She went on to explain that because of a time lapse from when the blood was drawn to the knowledge of problems with the lab, the decision was made to not send the blood to the Mayo Clinic — a move that the defense says should have been made to get an accurate reading. Dr. Todd Luckasevic, who conducted Klein’s autopsy, testified that his examination and information from Quest Diagnostics led him to conclude that “Dr. Autumn Marie Klein died as a result of cyanide poisoning” and that her death was a homicide. Marla Priestley, a fingerprint expert for the ME’s Office, testified that Ferrante’s print was on a bottle of cyanide seized from his lab. When the trial resumes Monday morning, the prosecution will call its final expert witness, who was unable to attend court Friday. Townsend said the Ferrante case has been full of testimony that may be tough for the jury to follow. 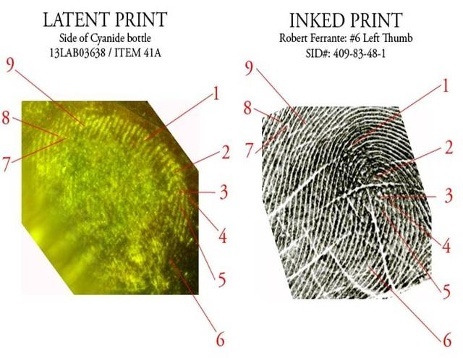 The Allegheny County District Attorney’s office released the follow emails and fingerprint images from those entered in evidence today’s court proceedings against Dr. Robert Ferrante.